Bitter Gourd/Karela (hagalkai in Kannada, pavvakai in tamil) has long being used in India not just as a food but also to control blood sugar among diabetics. This is because bitter gourd contains a chemical that acts much like insulin to lower blood sugar. Though there are no significant studies to support this, Diabetics in India do try and include bittergourd regularly(either as a food or as a juice). In some countries, bitter melon is consumed as a treatment for malaria as the bitter flavor is due to the melon’s quinine content. BITTERGOURD for LONG LIFE? ?Residents of the Japanese island of Okinawa have been known to have the longest life expediencies in the world. It is said that bitter gourd/karela is one of the secrets to Okinawa longevity because it contains high levels of health-promoting phyto-nutrients. This is a baked version of the traditional recipe using onions as the stuffing. I find that baking the karela first reduces the cooking time on the pan. Preheat the oven to 180C/350 F.
Prepare the karela by washing and drying them ( I don’t peel the skin,or apply salt to it, but you could if you feel it makes the dish too bitter). Slice each karela in the centre (without going all the way through) and scrape out the inside including the seeds using a teaspoon . Place the karela on a baking tray and bake for 30-45 mins (till it starts to shrink and brown a bit). If the karela is thick, it may require a bit longer, so keep checking. In the meanwhile heat the oil in a pan and add the onions and fry until golden brown. Add the spice powders and salt ,mix well. Fry for a few seconds and remove from the heat. Once cooled use a spoon or your hands and stuff the karela with equal amounts of the mixture. Smear any extra stuffing or oil on the karela. 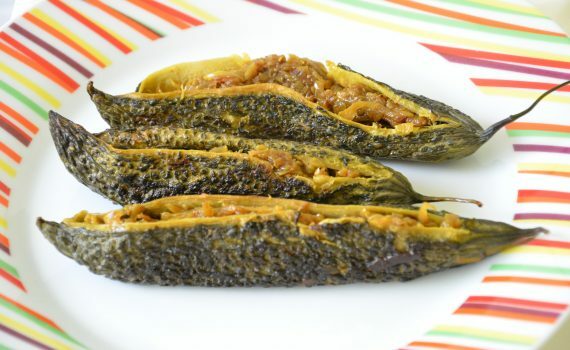 You can bake the karela again for a further 10-15 mins or pan-fry the stuffed karela in a teaspoon of oil for 5-10 mins. Serve with rice and dal or with roti’s and a sabzi. Once cooked the karela will keep refrigerated for up to a week.